What can I tell you about cake? I don't bake. I've been known to enjoy the odd piece of Battenburg (it's the marzipan) and I'll happily see off a seasonal hunk of Christmas cake (accompanied by cheese) - but that's about it. I suppose if I'm out at a coffee shop I might snaffle some millionaire's shortbread just for form's sake...although that's not really cake, is it? My favourite cake is probably Pear's soap, a lovely translucent bar - not for internal consumption. Therefore, being the contrarian that I am, you're in for another left-field take on this week's theme and the approach will be a somewhat roundabout one. I don't know how many of you are heavily into music; probably quite a few. Does anyone else regret having sold most of their vinyl albums back in the 1990s? I sold hundreds of them as I 'upgraded' to compact disc, for the economy of storage and ease of use as much as anything. I hung on to a few much-loved LPs that stood very little chance of ever getting re-released on CD but for years I had no turntable to play them on. I have to say I missed the ritual of getting records out of their sleeves, cueing them to play and then sitting perusing the album cover while listening to the music. The miniaturised versions of artwork that come with CDs lose something of the aesthetic beauty of the whole experience. Reason number one is that next Saturday (i.e. a week today on 21st April) it's Record Store Day with lots of special events and special vinyl releases to enjoy at old-fashioned record stores up and down the country. Blackpool still possesses two record stores and I'll probably pay a visit to both of them. I'm highlighting this now because all the fun will be over by the time next Saturday's blog gets posted. It's a distinctly quirky painting by an artist calling himself Neon Park xiii and prominent in the picture is a cake on a swing, jettisoning one sailing shoe. I decided that for today's blog I'd write a poem inspired (if that is the right word) by the cover art. I like to think of the cake as Sara Lee, after that iconic American brand whose tagline stated: "Everybody doesn't like something - but nobody doesn't like Sara Lee". Neon Park xiii (real name Martin Muller) was a US artist and illustrator best known for painting the quirky cover art for several Little Feat albums and for other musicians' records as well (the Beach Boys, David Bowie and Frank Zappa among them). He started to suffer from a numbness in his hands in his early forties and was eventually diagnosed with Amyotrophic Lateral Sclerosis, a degenerative disease with no effective treatment. Eventually he was unable to paint any more, so he concentrated on writing poetry, typing with one finger when he could no longer hold a pen. Sad to say, Neon died in 1993 aged just fifty-two. The term applied to the sort of poem I'm writing here is ekphrastic poetry, from the Greek words ἐκ and φράσις ('out' and 'speak' respectively); essentially a literary description of a work of art (in this case a painting) wherein the writer seeks to illuminate the scene and expand its meaning through the medium of words - making the picture speak. As I have absolutely no idea what Neon had in mind when he painted this scene, the imagination has free rei(g)n...should be interesting. Here we go - ekphrasticakes! As sometimes happens, this may not be its finished form. having passed the crumb test. This cake has surprising , hidden layers Steve. Please let us see the finished poem. Really inventive blog - look forward to hearing the finished poem. It’s all kicking off (although Lowell George’s exhortation was to ”PUT ON your sailin’ shoes”). Michael Philip Jagger at extreme right was presumably waiting to have his cake and eat it too. I was fortunate enough to be present at The Rainbow in January 1975 when LF tsunami’d the Doobie Bros. into oblivion. A definite Top 10 gig. 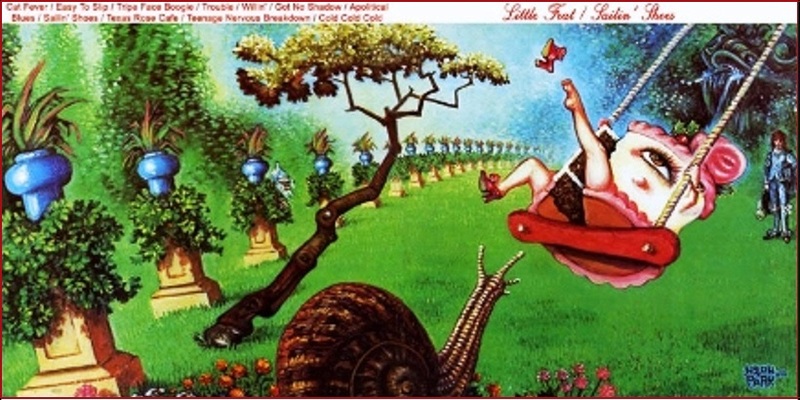 Will: one of my abiding musical regrets is that I never saw Little Feat live and kicking. Mine is sleeping through most of the Dead’s set at Bickershaw. As inhumane and uncomfortable as the circumstances were, and as plentiful and potent the recreationals, it was still a bad bad error of judgement. Entertaining as ever, Mr. R. Keep them coming. Exceedingly good that. Better than Mr Kipling (LOL). Most enjoyable blog. So what's in all time top 20? Lots of Beatles I guess. Please finish the poem. Does Sara Lee come to a sticky end? Did anybody else call records 'hot biscuits' back in the day? Is that just the DJ in me talking? Another great blog. I don't know Little Feat but I'll chase them down. Bad for the deaf, bad for the blind..."
Is that poetry? It's definitely Little Feat - 'Teenage Nervous Breakdown' from the Sailin' Shoes album. Great music. Lowell George RIP.